Maui Luaus: The Feast at Lele Made it onto Our Must-See List! Why The Feast at Lele is on my Must-See List! 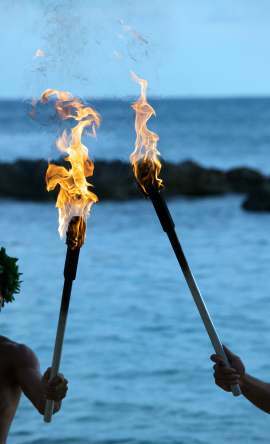 Maui luaus... ahhh.... going to one of these is one of my favourite things to do in Maui when we just want a relaxing evening. The Feast at Lele is one luau that is on my MUST-SEE list for our next Maui vacation. There are several reasons why. Firstly, most folks that have experienced this luau give it a pretty high approval rating. The Feast at Lele, along with the Old Lahaina Luau, are commonly said to be the 2 best Maui luaus. Not surprisingly, they are both run by the very same people! The show sounds like it would be excellent - it features authentic entertainment from Hawaii, Tahiti, Samoa, and the Maori people of New Zealand. As you watch each island's entertainment, you'll be treated to cuisine from that very same island. Gourmet Food at a Luau? You bet! The food here is most definitely not your typical luau fare! For starters, the Feast at Lele does not provide a buffet like all the other luaus. Instead, you'll have your very own waiter or waitress serving you a 5 course culinary tour of Polynesia. The food is said to be of high quality and elegantly plated. Each of the first 4 courses is from a different Polynesian island: Hawaii, New Zealand, Tahiti, and Samoa. The 5th and final course is a selection of Polynesian-inspired desserts. I'm not a terribly adventurous eater, and many of the menu items are unusual. BUT, after checking out their menu, I think that even I would find at least ONE thing in each course that I'd enjoy. Also, I've heard that if you don't like something on the menu, you can ask your waiter if they have an alternative to bring you. The third reason why the Feast at Lele is on my MUST-SEE list is that every group gets its very own private table. Getting your own private table is pretty much unheard of at a luau... so if you're looking for a more intimate luau experience, the Feast at Lele is a good choice! Even if all you need is a table for two, they can accommodate you. This is one of the reasons why out of all the Maui luaus, this one is said to make for a very romantic night out for couples. Gotta Love a Fire Dancer! For more information about this luau, see our Feast at Lele FAQ page. Click here to find out more about why I recommend Barefoot Tours for your Maui, Hawaii activities bookings! Have you been to any Maui luaus that deserve a MUST-SEE rating? Share your story here! 1) Click here for my guide to choosing your perfect luau, plus, a complete listing of ALL the Maui luaus! 2) Read about our top things to do on Maui for relaxation here!